President Moon Jae-in talked with his U.S. counterpart Donald Trump on the phone on Tuesday night about the upcoming U.S.-North Korea summit and other issues. The two leaders chatted about the results of pre-summit talks between U.S. and North Korean officials. Their conversation went on for about 35 minutes. 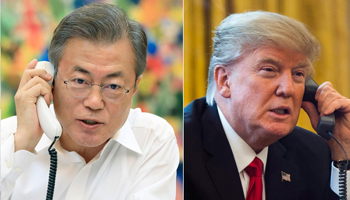 Moon told Trump that Seoul is ready to link railways between the two Koreas and implement cross-border economic cooperation projects to ease the financial burden for the U.S., according to Cheong Wa Dae spokesman Kim Eui-kyeom. Trump said he is looking forward to a big success in Hanoi and a meeting with Moon in person. But Trump is also downplaying expectations for the summit. He told reporters in the Oval Office the same day that as long as there is no testing of rockets, missiles or nuclear weapons by Pyongyang, he is in "no rush" to see North Korea denuclearize. "No rush whatsoever. We're going to have our meeting. We'll see what happens. I think ultimately we're going to be very successful," he said.